This is a super quick and happy card for my mom who used to make a “pufferfish” face when we were kids and needed to get a id or passport photo. We always had some great big happy smiles on those! The puffer fish is from Lettering Delights and it was a breeze to open it in the Designer Studio edition software, check the “cut lines”, un-group, and cut. I used some glossy accents and coarse glitter to add a little sparkle and texture. The sentiment is from Waltzing Mouse. There is a little dimension under the fish but it is still flat enough to mail without the need for hand canceling. I hope it will bring a smile to her face. This is so sweet– and I love the story behind it! I bet she will love it! So cute! I love the colors. Makes me smile looking at him. Very fun card that sure to make anyone smile. 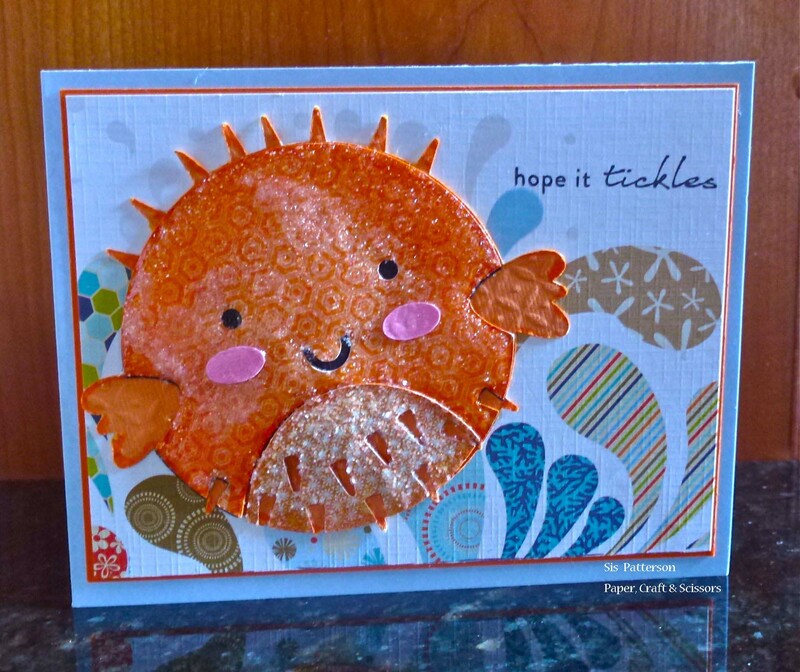 That is an adorable puffer fish and card!! !